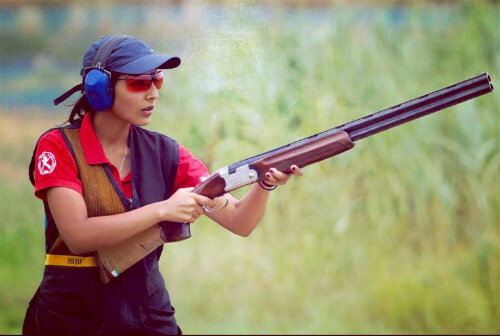 "It all started to get real the first time I made the cut for the Indian shooting team. I was ecstatic when I got my Indian kit. The feeling is unmatched. For me, motivation comes in different ways and carrying the country’s flag is one of them. With the support of my friends and family, I powered ahead and didn’t let the tough times knock me down. My first World Cup was another watershed moment and it assured me that I’m doing what I'm meant to. Despite all the highs, there have been lows as well. There have been many incidents that have collectively made me stronger and more confident. But to name one would be probably the first time I traveled with the Indian team for my first competition when I was 16. I was young, I didn't know anyone, and everyone had to just focus and be by themselves. I was nervous and excited at the same time. No one was there to comfort me. I felt alien to the new surroundings and I remember talking to my father about it. He told me that I just need to be there for myself and accept how it's going and it'll all make sense. This was the moment I needed to remember why I took up the sport - for my grandfather - the strongest man I've ever known. He passed away a few years ago, and I started to shoot in his memory. My grandfather's dream for me, made me believe in myself. Being dependent on the people surrounding you is fine, but the only person you always need to look out for is yourself and that's the only way you can pick yourself up and learn to deal with everything thrown at you. That’s the hard part, but once you get over it, you’ll find that things get much easier. Like they say, the mind gives up much before the body; being dependent solely on myself changed the way I think to a great extent and also who I am today. Of all the lows I’ve faced, one did stick with me for quite sometime. As a sportsperson, I understand that which ever field you're in, underlying that is the physical strength to be able to perform well. Unfortunately, when women are strong and muscular, they're exposed to inappropriate comments. There are so many girls who give up a sport to avoid their bodies being a certain way. This idea of how women are just supposed to be - fair, petite and tall - degrades the spirit of sport. Sport is about overcoming your fears and not letting other people instill them in you. Being confident and comfortable in your own skin is so important, because when people sense any of it missing, they just try to pull you down and make you feel small and insignificant. Fighting back and breaking these stereotypes is the only way to change things. Fitness and health are two very important aspects of training. When you're a sportsperson, you can only go up to a certain level with your strength and ability, but you have to step your game up and reach the level where the best athletes are. It's about being the strongest, both mentally and physically. And so, strength and conditioning training plays an important role. The right gear plays an important role as well. The right kind of shoes, the right kind of training, the right kind of clothes and the right kind of equipment all come together to make an athlete successful. Apart from my physical conditioning, I am thankful to my parents - my main support system. They understand my commitment to the sport and they make me believe in myself when even I don't. My advice to POPxo readers and women is to never let anyone tell you you can't do something. Always go for what you believe in and forget the odds. Be true to yourself and keep moving forward." Maheshwari Chauhan is an Indian shooter. She aspires to change the way women athletes are perceived in India. * This post is in association with PUMA. To be a part of the DO YOU movement register here.